A couple that could no longer contain themselves and decided to carelessly damn all consequences by having s’ex at a street corner in broad daylight is making waves online. The incident occured at Mugodhoyi street in Zimbabwe on Sunday, November 20. The intoxicated lovers had it at the street corner while people were passing by. 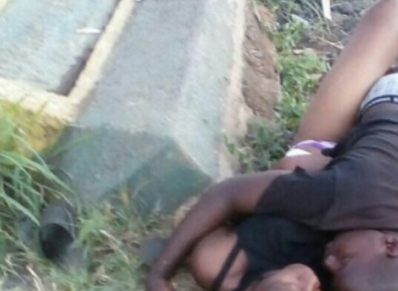 According to local residents, the drunk man identified as Lovemore Jiri who works at the Laboratory section Triangle mill, met the woman identified as Catherine. They went drinking at Tockridge bar and then lost control afterwards. They proceeded to Rufaro B compound where they had agreed to have a quickie session but could not reach the house they had intended to use when they unleashed their passion. They ended up using a road billboard at Mugodhoyi street.